Network Power Scheduling applies radio scheduling algorithms and resource reservation techniques to reduce the power consumption of motes in ad-hoc sensor networks. 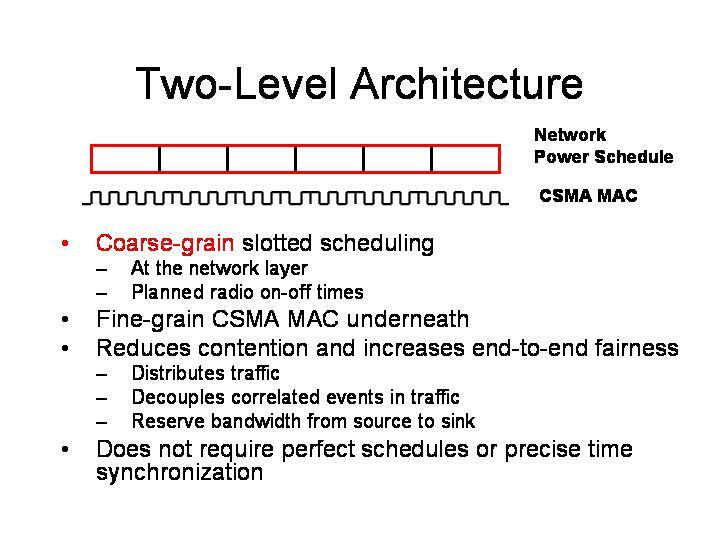 This research introduces a novel two-level network architecture which combines coarse grain slotted scheduling at the network layer with csma at the mac layer. The scheduling algorithm is distributed and adaptive, allowing schedules to change dynamically to changes in topology and fluctuations in demand. Please see Algorithm Details, Chapter 3.4. Network Power Scheduling is a novel network architecture approach for reducing radio power consumption in wireless sensor networks through traffic scheduling. The approach uses a decentralized algorithm, Flexible Power Scheduling (FPS), to schedule entire traffic flows, not packets, at the network layer across multiple hops. The scheduling is based on time-division at the network layer, rather than the MAC layer, to achieve significant power savings, reduced contention, and increased multihop throughput and fairness. FPS provides adaptive scheduling to support changes in topology and fluctuations in demand (multiple queries and aggregates). Energy savings are achieved by powering down nodes during idle times identified through dynamic scheduling. FPS is implemented in TinyOS and has been evaluated on two real-world sensor network applications, TinyDB and GDI, and three hardware platforms, mica|mica2|mica2dot. We show that a power savings of 4.3x for a 35-mote TinyDB deployment can be achieved compared with the existing power management of TinyDB (applicaton-level duty cycling), and a 160x power savings over no power management. In in-lab experiments comparing GDI/fps with GDI/low-power-listening, FPS has increased yields by 12% and lower power consumption by a factor of 4.6X over low-power-listening. We also present experiments that show a 3x reduction in contention, a 3-4x improvement for throughput for multihop flows, and a significant increase in fairness across multihop flows. 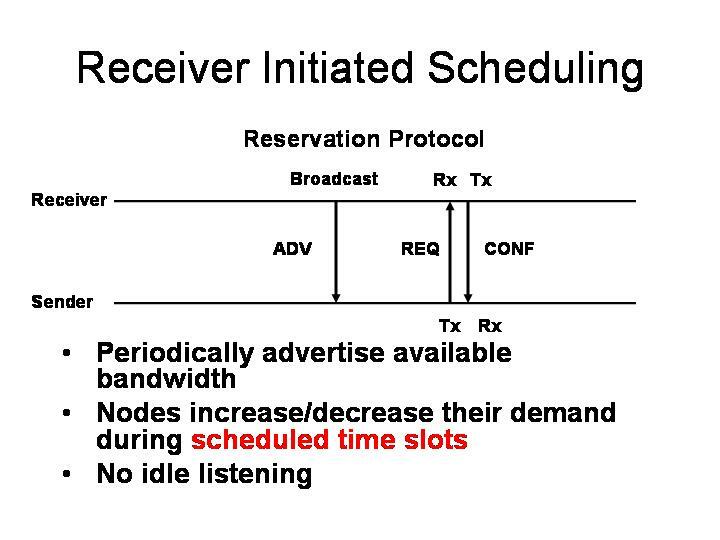 A talk on Network Power Scheduling . Selected code available at SourceForge TinyOS Project. Barbara Hohlt and Eric Brewer. Network Power Scheduling for TinyOS Applications, [pdf] IEEE International Conference on Distributed Computing in Sensor Systems, June 2006. Algorithm details in Chapter 3.4, "The Design and Evaluation of Network Power Scheduling for Wireless Sensor Networks", [pdf] Computer Science Division UC Berkeley, PhD Dissertation, May 2005. (UCB/CSD-05-1410 May 2005) . Barbara Hohlt and Eric Brewer. Twinkle: Network Power Scheduling in Sensor Networks, [pdf] ( UCB/CSD-05-1409, April 2005). Barbara Hohlt, Lance Doherty, and Eric Brewer. Flexible Power Scheduling for Sensor Networks, IEEE and ACM International Symposium on Information Processing in Sensor Networks April 2004 [pdf ],UCB/CSD-03-1293 January 2003.